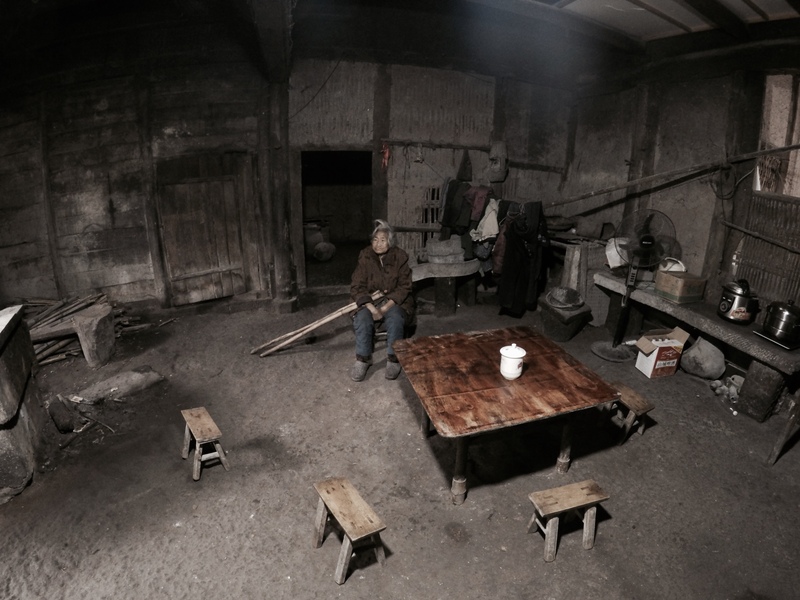 Wang Bangxian lives in Tiantaishan village in Guizhou province, China. On a rainy day many years ago, she set off on the long and arduous journey home after fetching buckets of clean water from a mountain spring. When full, her buckets weighed as much as she did. 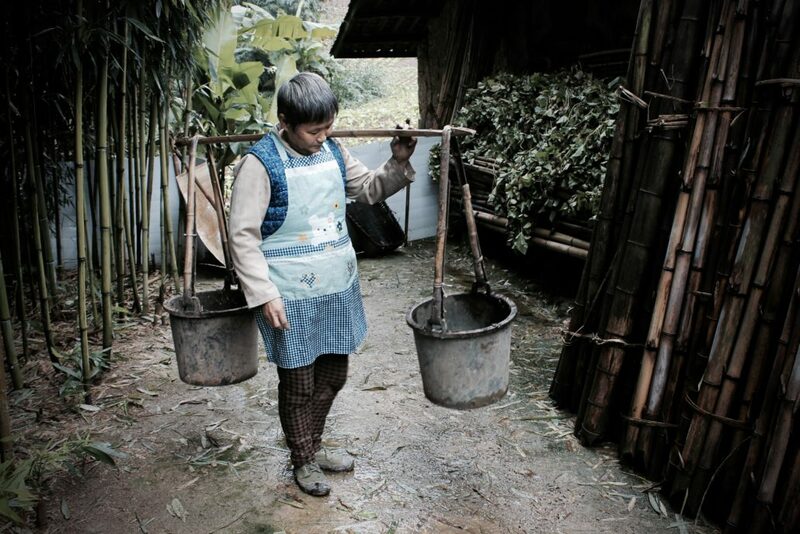 Wang Bangxian demonstrating how she used to fetch water with buckets. The buckets are now used to transport animal feed and fertiliser instead. She had to make the trip twice a day, rain or shine, in order to fetch enough water for drinking, cooking and washing. 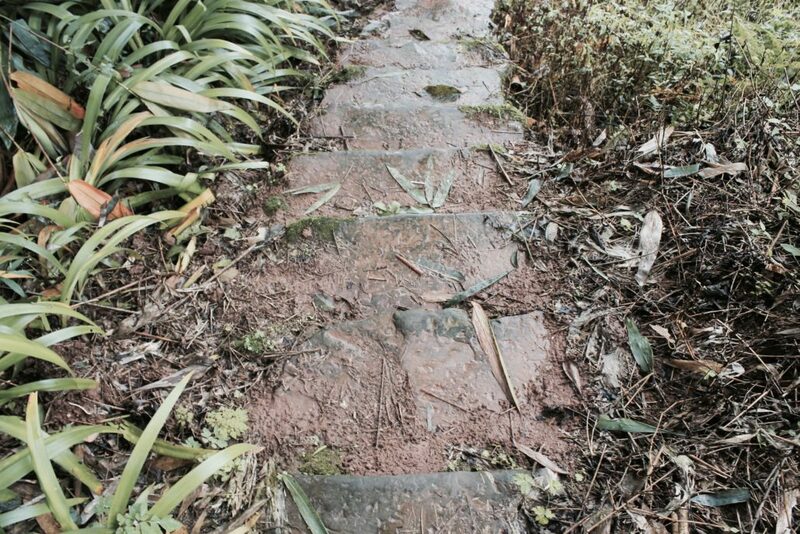 On that fateful day, the rain had made the precipitous, mud-strewn trails even more slippery and dangerous. In a hurry to get home to her infant son, Wang Bangxian tripped and fell, breaking her foot and spilling the water. The mountain trails are often muddy and slippery after a heavy rain. Wang Bangxian recalls being bedridden for weeks after her fall. 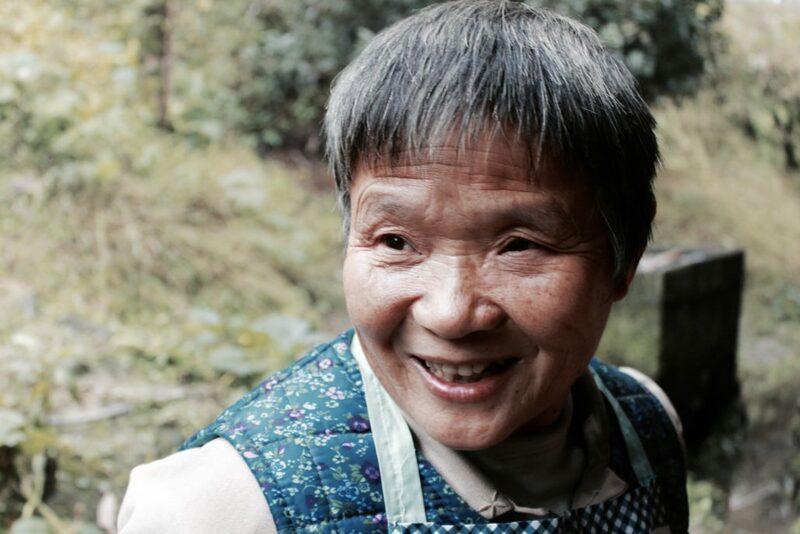 She eventually made it home, but for half a month afterwards, Wang Bangxian was bedridden. Her husband had to sacrifice farming time to fetch water for the family. 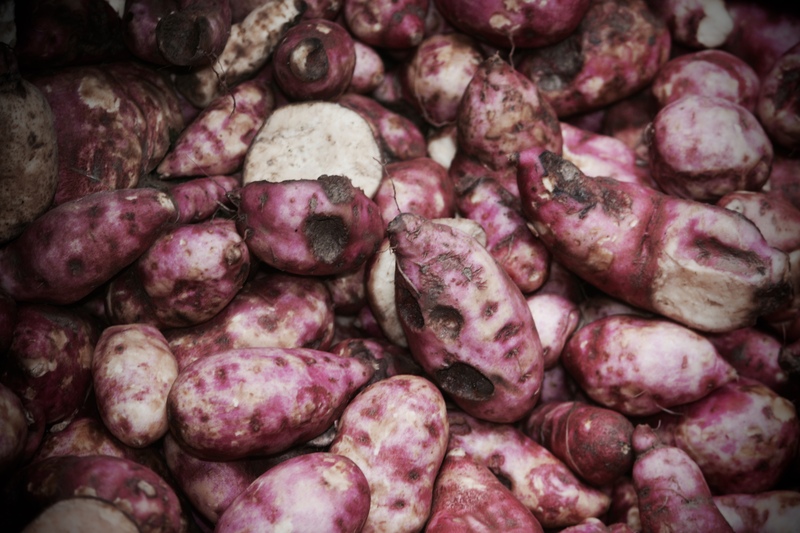 As farmers who depend solely on their crops for income, their livelihood was threatened. 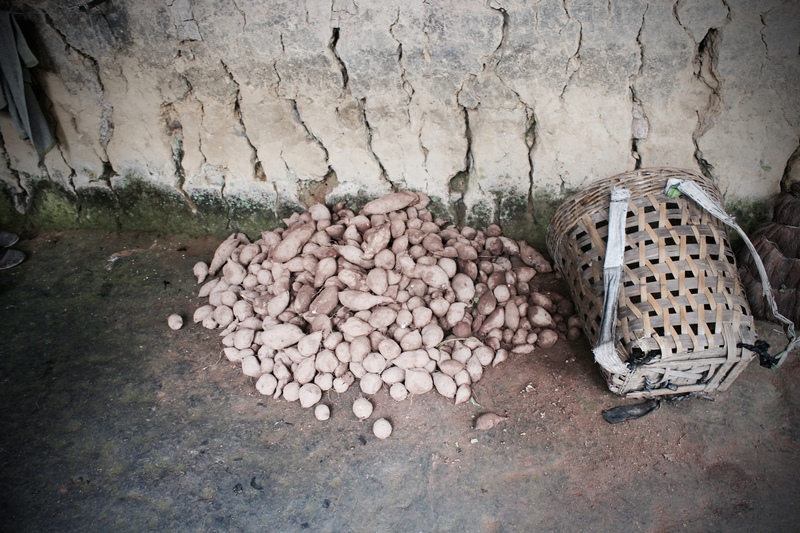 Wang Bangxian and her husband still farms potatoes and sweet potatoes, which are photographed above in their home. Over time, she was able to get back to her normal routine but her foot still hurts to this day. Rolling up her pants, she showed me a visible raised bump on her foot about the size of a small grape. 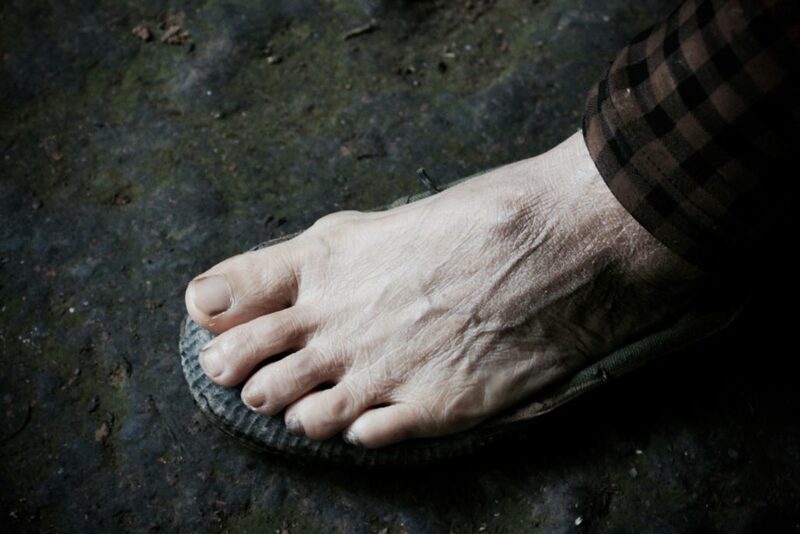 The raised bump on Wang Bangxian’s foot shows the site of her injury. With limited access to medical care back then, she used herbs to nurse her foot back to health. 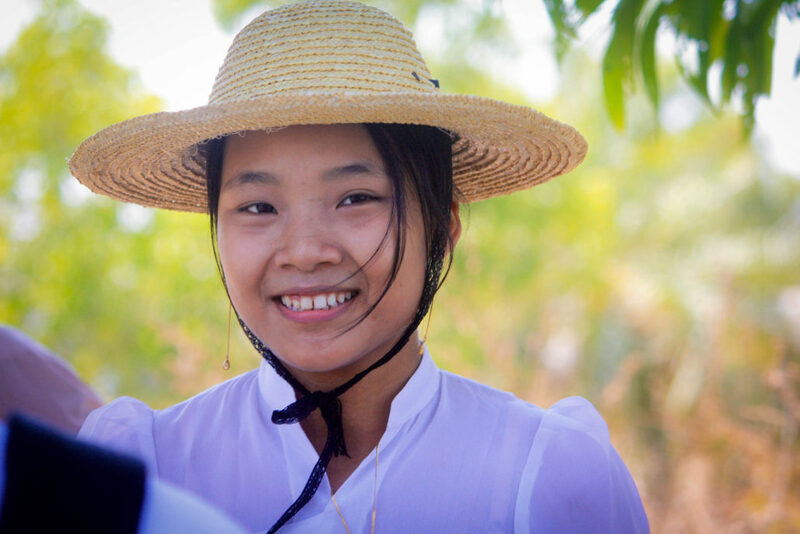 Wang Bangxian was overjoyed when Village Water Management (VWM) programme brought access to clean piped water right to her home. These days, she no longer has to carry heavy loads of water along treacherous mountain roads, and has more time for farming and raising livestock. 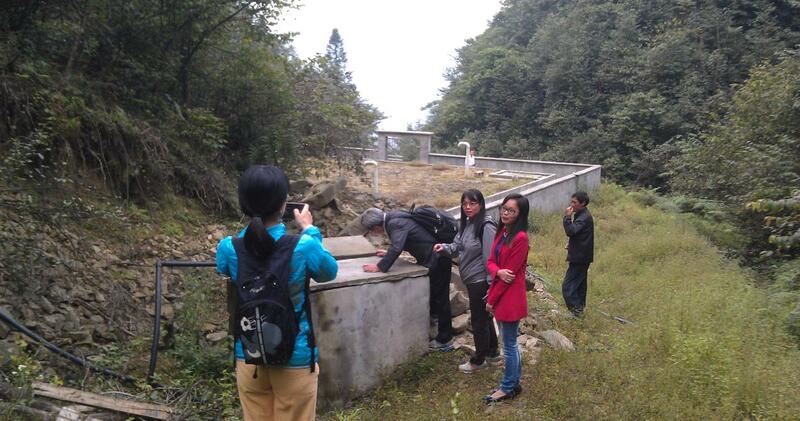 This project in Tiantaishan village, Guizhou implemented under the Village Water Management (VWM) programme in China, is co-funded by CITIC Envirotech. The Village Water Management (VWM) programme mentors a regionally or nationally available platform of grassroots leaders residing within the community, enabling them to implement clean water projects for the sustenance and development of their communities. The VWM programme is delivered in locations where available water sources are relatively clean but significantly distant from households. 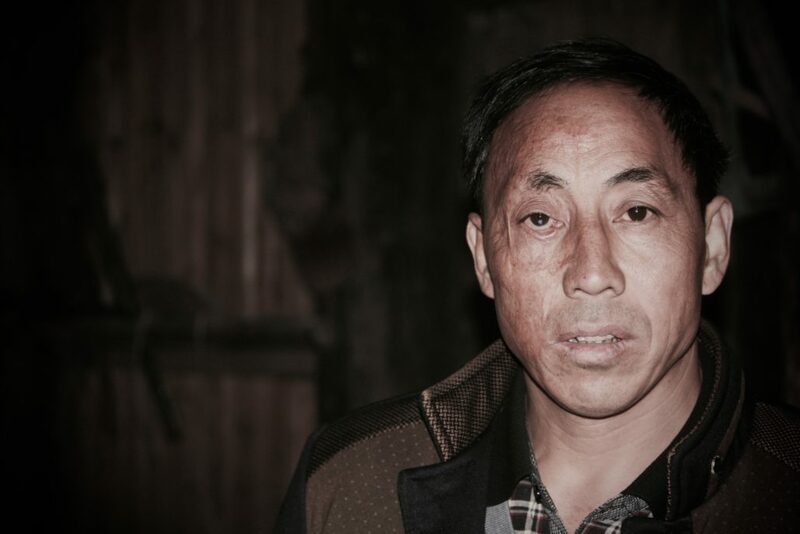 Ran Fangqing, 46, lives in a small village deep in the mountains of Guizhou province, China. A fire during his childhood left him partially blind in one eye and half of his face covered in a complex network of scar tissue. The fire, however, was just the beginning of a string of unfortunate events. Fangqing eventually got married, only to have his wife depart soon after the birth of his only son, leaving him to juggle the roles of both a father and a mother. 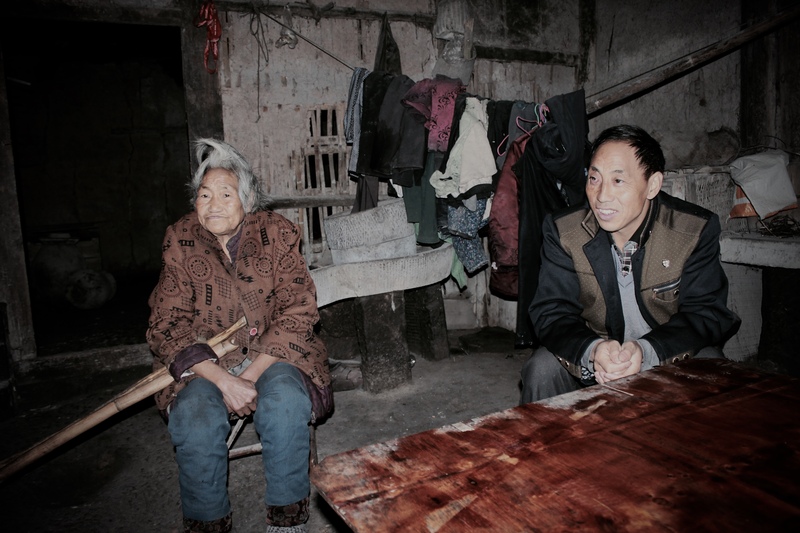 Beyond parenting duties, as the only abled-bodied person and sole bread-winner of the household, Fangqing also had to travel daily along treacherous mountain trails to fetch water, cook, wash, provide and care for his aging mother and infant son. Life only got more difficult when his elderly mother became senile. She started to panic whenever Fangqing left the house, and refused to eat whenever he was not around. 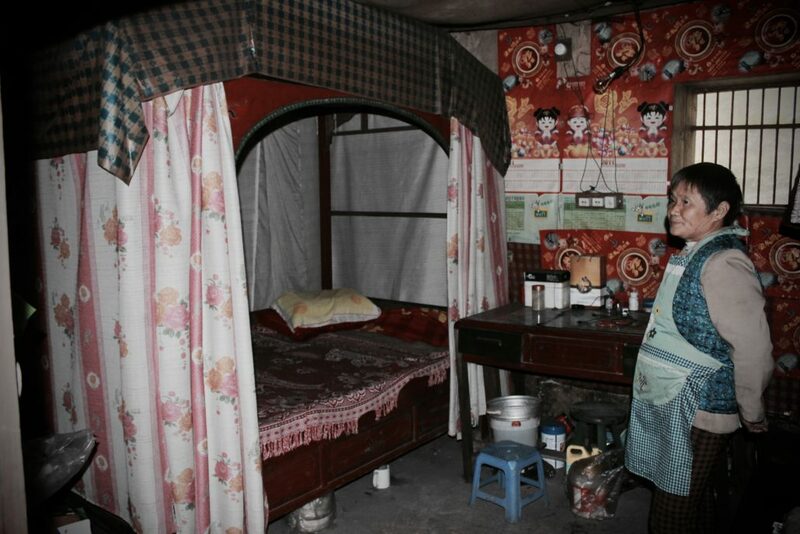 As her conditions deteriorated, Fangqing was unable to even leave the house to fetch water. With few other alternative water sources, the family had to sometimes resort to drinking from muddy puddles and ditches. When we visited, his mother was already incoherent in her speech. The elderly woman had lost all her teeth and her movements appeared to be laboured. 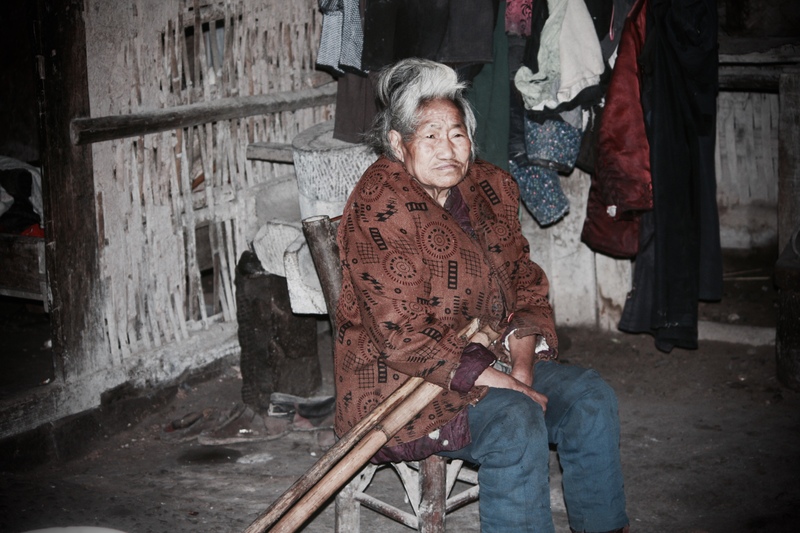 She used a pair of bamboo sticks as makeshift crutches to move around the small house. The only coherent words that she uttered when we were there were strange and somewhat morbid – “I do not want to be buried in these clothes”, she said. 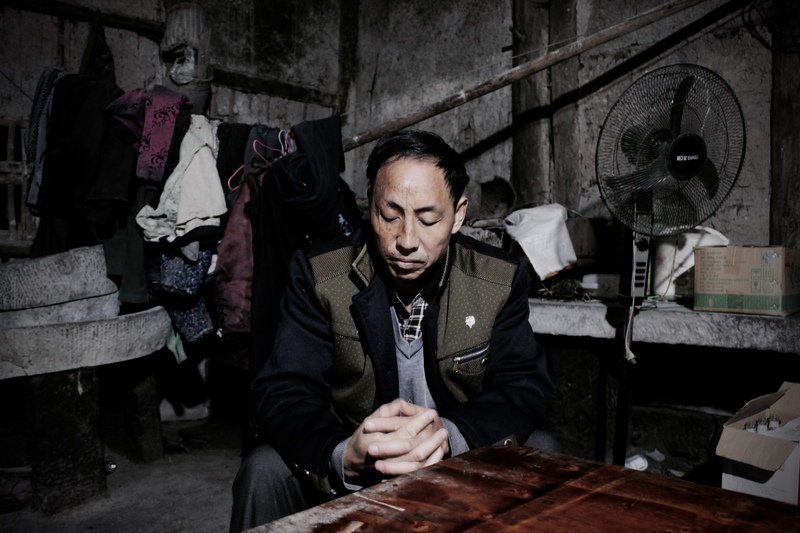 For years, Fangqing struggled to fulfill the family’s most basic needs – food and water. 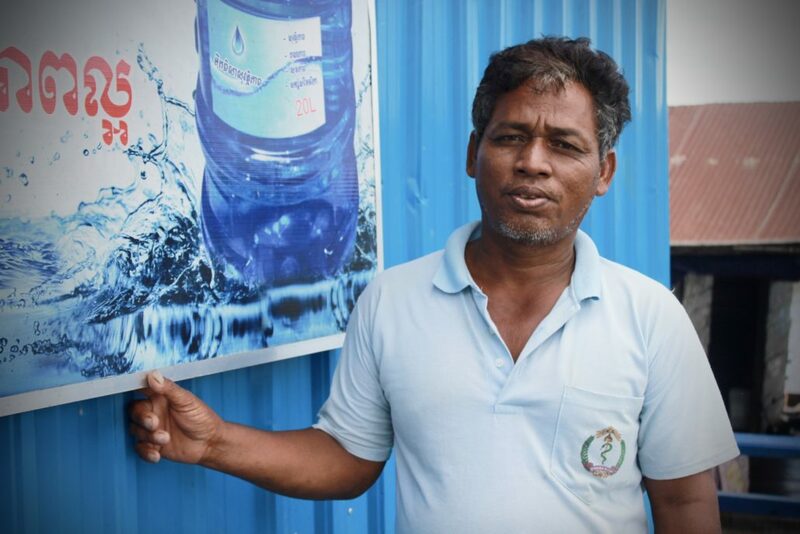 A heavy burden was lifted off his shoulders when Lien AID’s Village Water Management programme brought clean water from a mountain spring directly to his home. On the day we visited, he was just about to cook lunch. He washed and prepared the food while keeping a close eye on his mother. 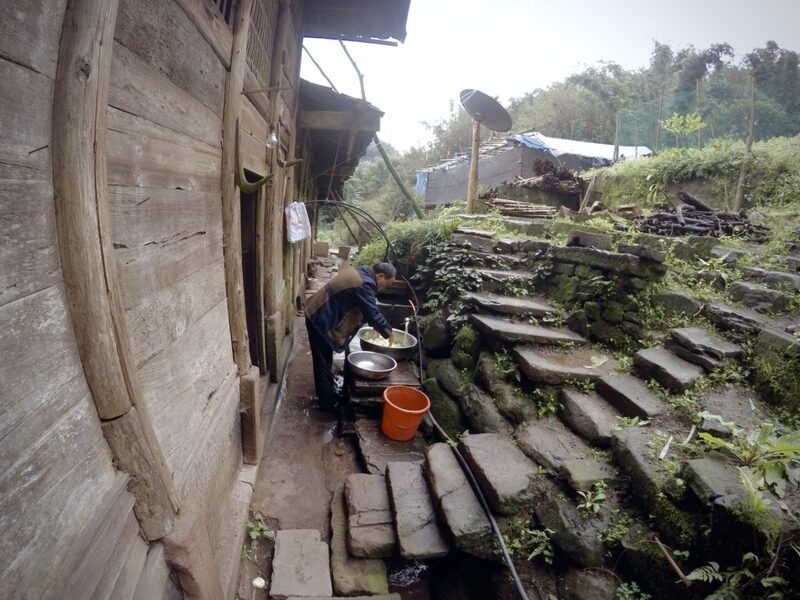 Fangqing washing vegetables using clean piped water right in his home. 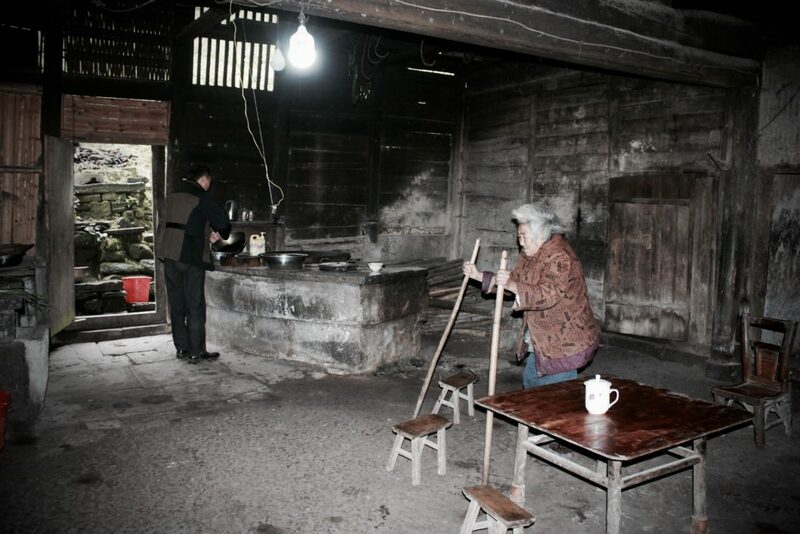 Fangqing preparing a meal in the kitchen as his mother wanders about the house using her makeshift crutches. 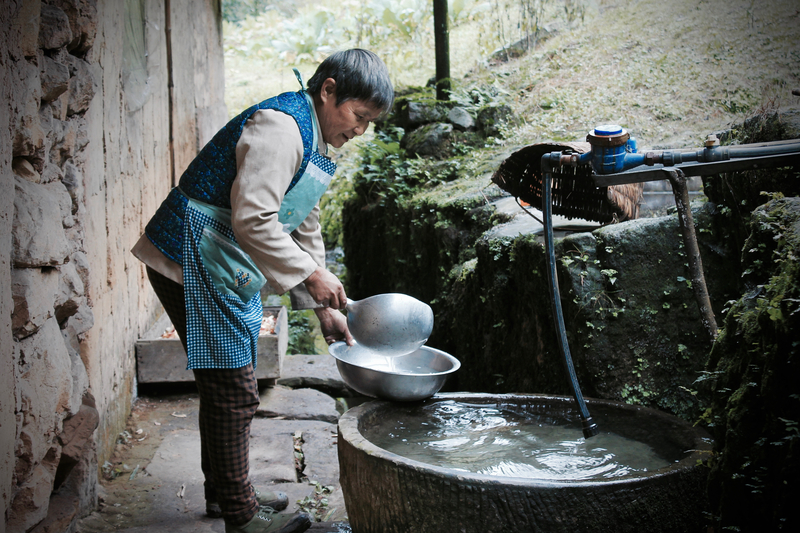 Having clean water piped directly to his house has not only made life more convenient, but it has also improved the quality of life for Fangqing and his small family. 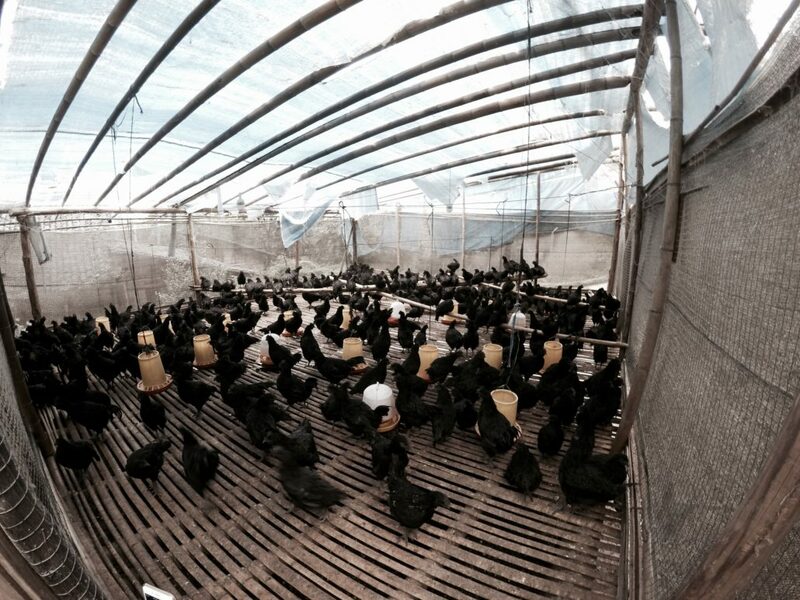 Soon after he gained affordable and convenient access to clean piped water, Fangqing started raising chickens and fish to earn more income. He now maintains a small chicken coop as well as several fishponds in the vicinity of his home. “In the past, we did not even have enough water to drink. Now, life has gotten better. I have enough water to rear chickens and fish.” Almost all of the extra income that Fangqing earns now goes towards supporting his only son, who will soon graduate from high school in a nearby town. Fangqing’s home – the chicken coop is on the right while his fish pond is visible in the background. The water storage tank, from which water is now directly piped to the village homes. 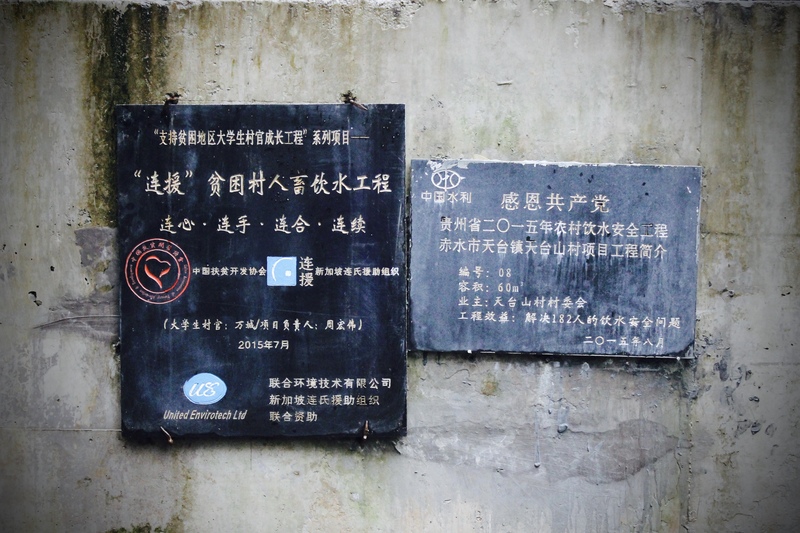 This project in Tiantaishan village, Guizhou province, implemented under the Village Water Management programme in China, was co-funded by CITIC Envirotech. Thai Thorn was a special boy. Despite being born in the floating village of Deyroneath with difficult living conditions, Thai Thorn was a happy child, who found delight in little things like his toy gun and car. Thai Thorn’s mother described him as a bright child. He was adorable. He was playful. He was talkative. He was also mature for a three-year old. At lunch time, he would scan the lake for his father. When he spotted his father’s boat, he would call out to him to come home for lunch. For generations, families in the floating village have been drinking from the lake that they defecate in. Thai Thorn, like most children in the village, suffered from poor health, typhoid and chronic diarrhoea. 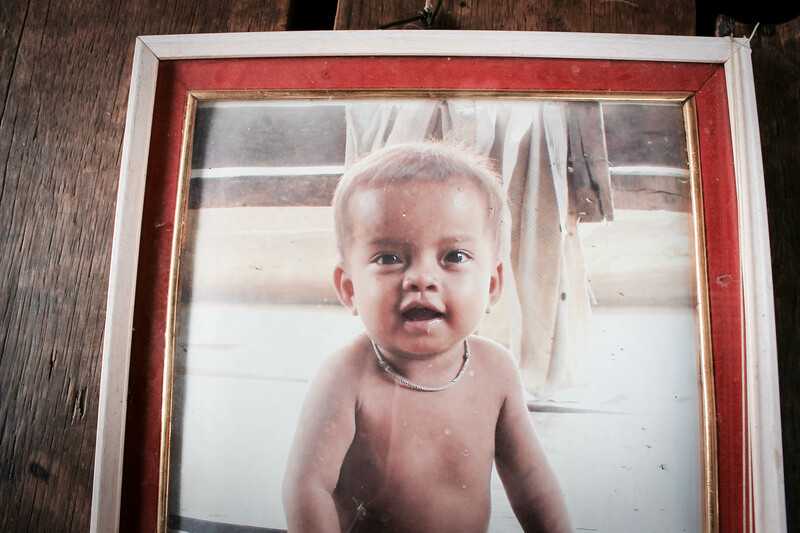 When Thai Thorn was three, he had fever and diarrhoea again. Having experienced this situation countless times before, the family gave him the usual medication they used for their other children. But this time round, the medication did not work and the fever persisted for four days. On the fifth day, they got hold of a nurse and the suspected diagnosis was dengue fever. Thai Thorn was given an injection and put on drip. But it was too late. Two hours later, he stopped breathing. Thai Thorn’s mother, Pong, sits facing the corner where he took his last breath. With no money and land nearby for a proper burial in the wet season, the family wrapped the boy’s body in cloth and hung it on a tree. When the dry season came and parts of the lake dried up, they took the remains down and buried him. Pong was devastated over losing her youngest child and cried for a month. It took her 3 years to get over his death. “I always think about him when we sit down to eat together. Sometimes it still makes me cry. He would have been seven this year,” she says softly. While the exact cause of Thai Thorn’s death may never be known, the lack of clean water had played a part in his frequent diarrhoea and poor health. After his death, the family grew increasingly concerned over the health of their other children. It was unthinkable if the same tragedy happened to their youngest daughter, Thai Heav. Thai Heav, 11, drinks clean water from the CWE treatment plant. 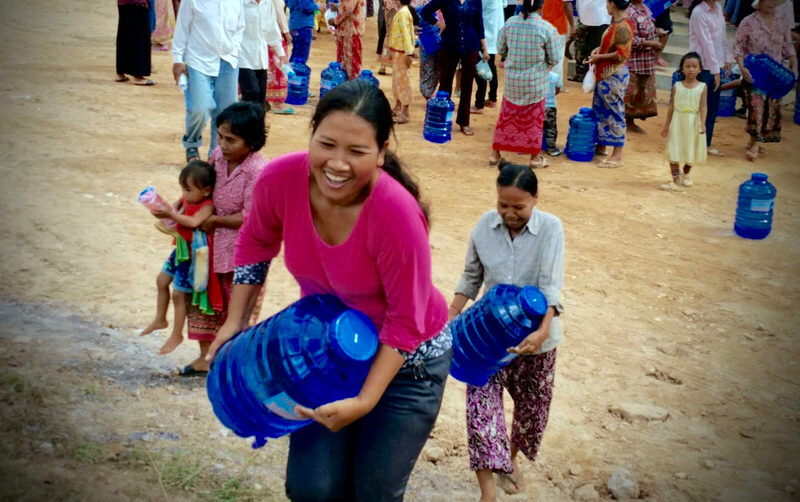 When Community Water Enterprise (CWE) came to the village, the family was finally able to afford clean drinking water. Today, the family also practices better hygiene habits, and monitor the health of their children more closely. Diarrhea and fever are no longer usual occurrences among Thai Thorn’s siblings. 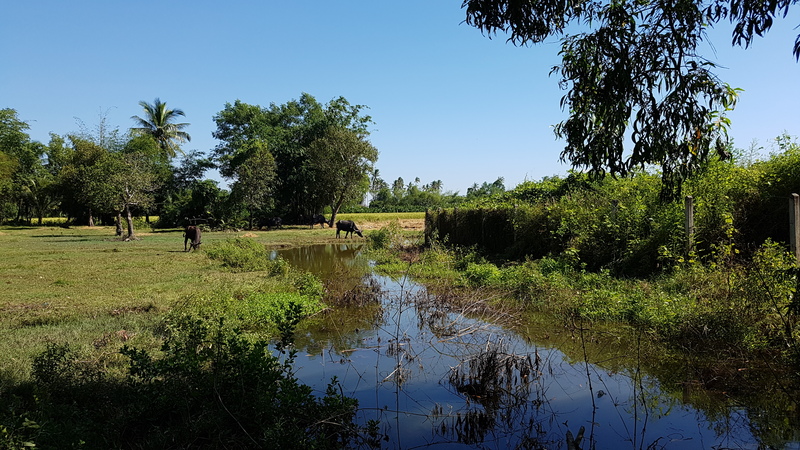 This project in Meteuk Commune implemented under the Community Water Enterprise programme in Cambodia, was supported with co-funding from Sabana REIT. By the time our boat arrived at Kakayo village, located in the south part of the Ayeyarwady region in Myanmar, a small crowd had gathered at the wooden jetty. A tall, slender woman stood out from the crowd. Greeting me with a firm handshake, she introduced herself as Daw Mu Mu, a member of the village development committee. Daw Mu Mu standing at the edge of the construction site for the new rainwater collection pond. 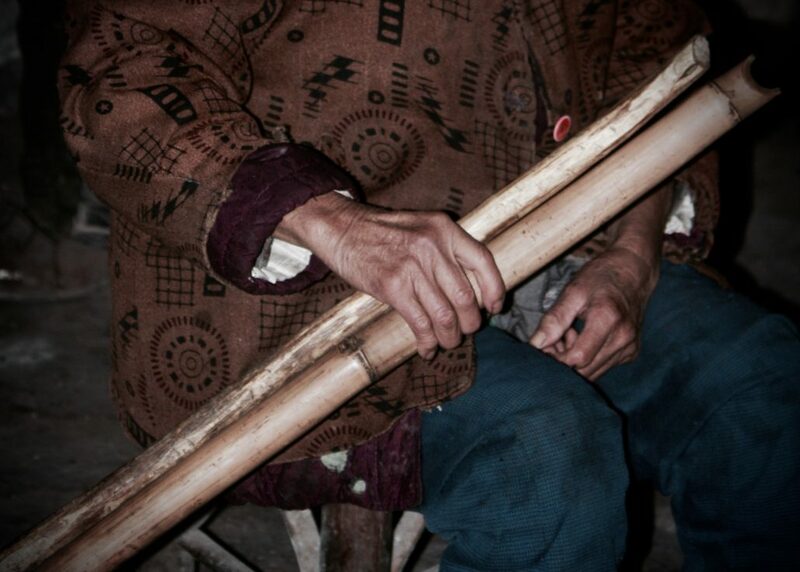 It soon became apparent that Daw Mu Mu was a well-respected figure in the village. Carrying with her an indefinable air of grace, she led the way with long strides as we surveyed the construction site for the new rainwater collection pond. Apart from sitting on the village development committee, the 51-year-old woman wears many other hats – she is also a mother, provision shop owner and farmer. Unwilling to let her only daughter, Myint Zu Aung, accept the fate of an ordinary village girl, Daw Mu Mu’s foresight led her to a neighboring village in 2008, where she worked hard to earn more income so that her daughter could attend school in nearby Labutta city. 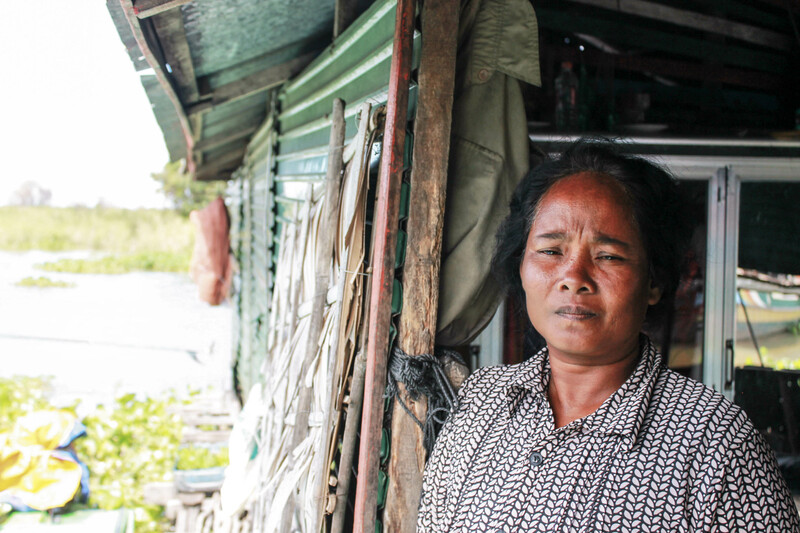 Her husband stayed behind, working as a fisherman like most of the other men in the village. The couple worked hard to support their child, in the hopes that she will eventually lead a better life than they did. Then Cyclone Nargis struck. Having never experienced a natural disaster of this scale, Daw Mu Mu rushed back to the village not knowing what to expect. Nothing could have prepared her for the extent of the damage that was done. The cyclone had wiped out most of the village population, leaving behind it a trail of wrecked homes, uprooted trees, dead animals and disfigured human corpses. Myint Zu Aung, Daw Mu Mu’s daughter. She is now 20 years old. Though shackled by grief, Daw Mu Mu did not have the luxury of mourning for her lost loved ones for long. She went back to work and started to rebuilt the village with others, working twice as hard as before, this time singlehandedly supporting her daughter’s school fees. Miraculously, her husband returned unharmed after being missing for 2 years and 4 months. It turns out that his fishing boat got carried away by the current and ended up on the Indian shores. 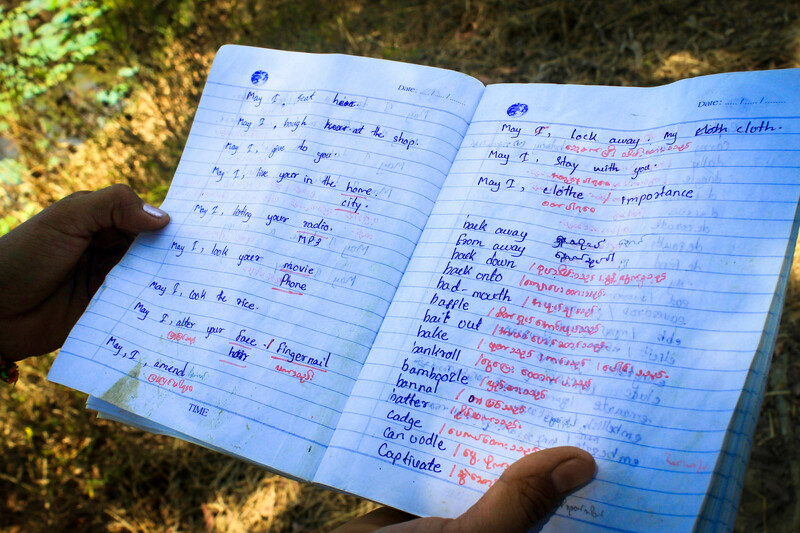 Myint Zu Aung’s English exercise book. But the problems kept coming. The village’s only source of relatively clean water was two village ponds, with water levels often dropping dangerously low during the dry season. In 2016, the ponds dried up, and the children in the village started drinking dirty water when their parents were away fishing or farming. Women collecting water at the existing pond with buckets. It was not long before the village was hit by a diarrhoea epidemic. Many of those affected were young children. Daw Mu Mu and the other villagers converted the village school into a makeshift health centre to quarantine and care for the patients. Tragically, they could not save a two-year-old boy in time and he passed away. Daw Mu Mu was devastated and could not bear the thought of losing more family and friends. 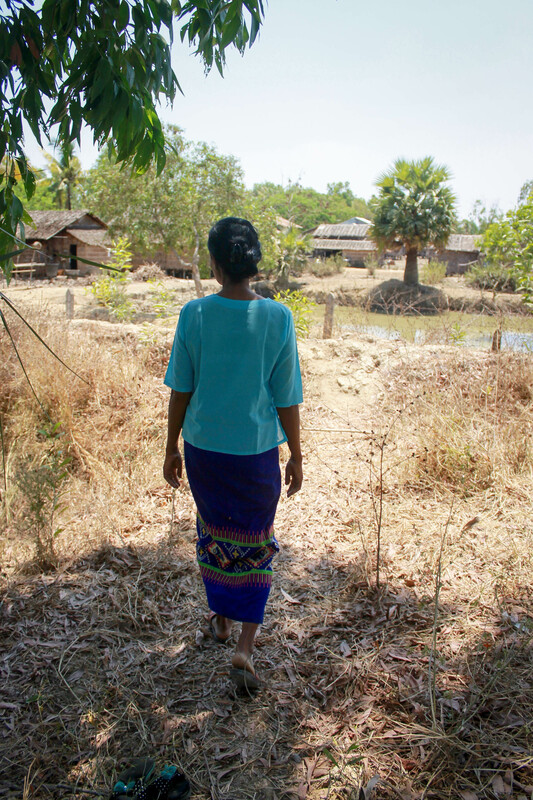 She was determined to improve living conditions in the village, starting from better access to clean water. Early this year, construction began on the new fenced pond and hand pumps in the village. When completed, the new rainwater collection pond will provide an additional source of clean water for the villagers during the driest months. The construction site for the new rainwater collection pond. 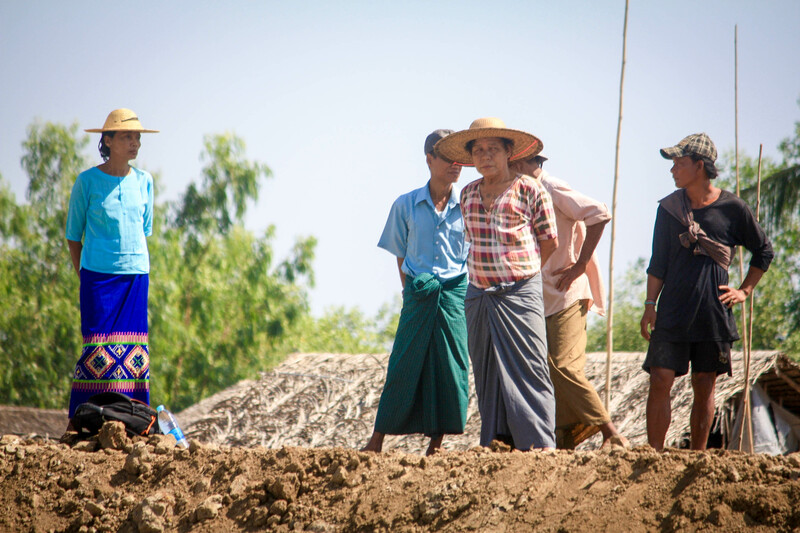 Daw Mu Mu hopes that villagers will enjoy better health after the new pond and hand pumps have been completed. Like many of the other villagers, her daughter regard her as a role model. When I commented on her strength and resilience, what she said stuck with me throughout the rest of my journey in Myanmar. 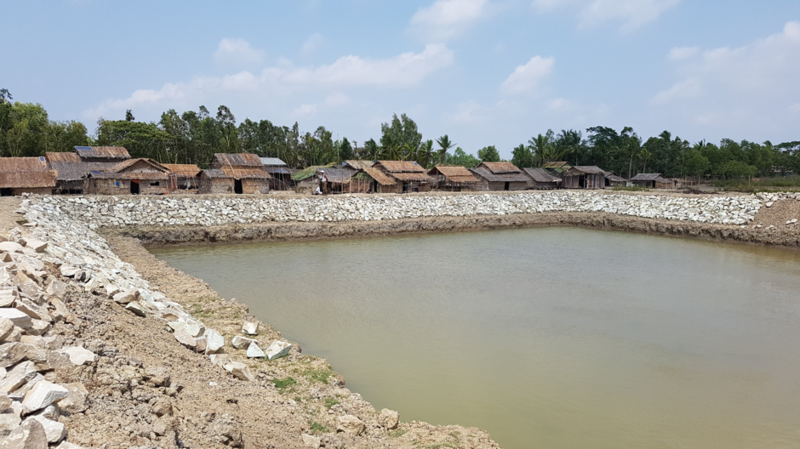 This project in Kakayo village, Labutta Township co-funded by Lien AID, is implemented under our pilot clean water projects in the Ayeyarwady region in Myanmar, and expected to be completed in 2017. Extract: This story was told by Sou and Tab, villagers in the floating village of Deyroneath. They tell of the tragic loss of their first son, and how life has gotten better since CWE enabled villagers to gain sustainable access to clean water. 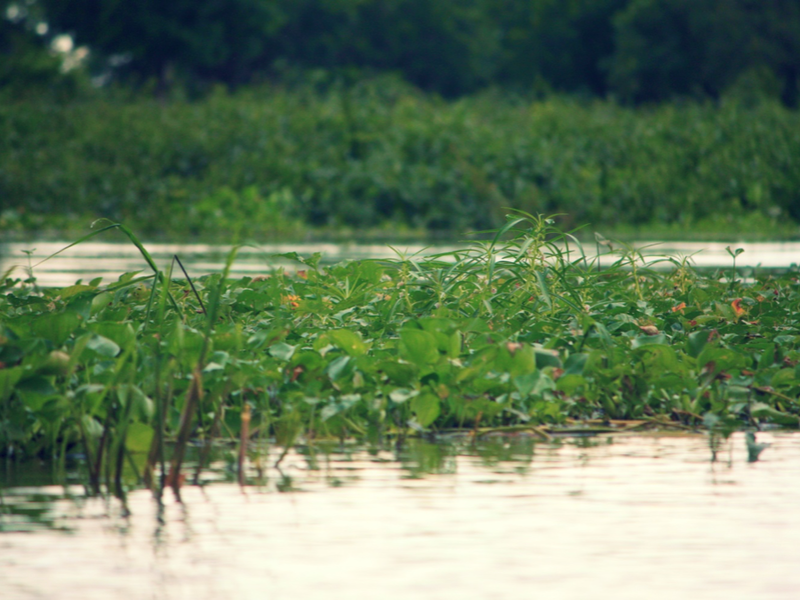 The Tonle Sap lake has long been revered for being one of the world’s most varied and productive ecosystems. 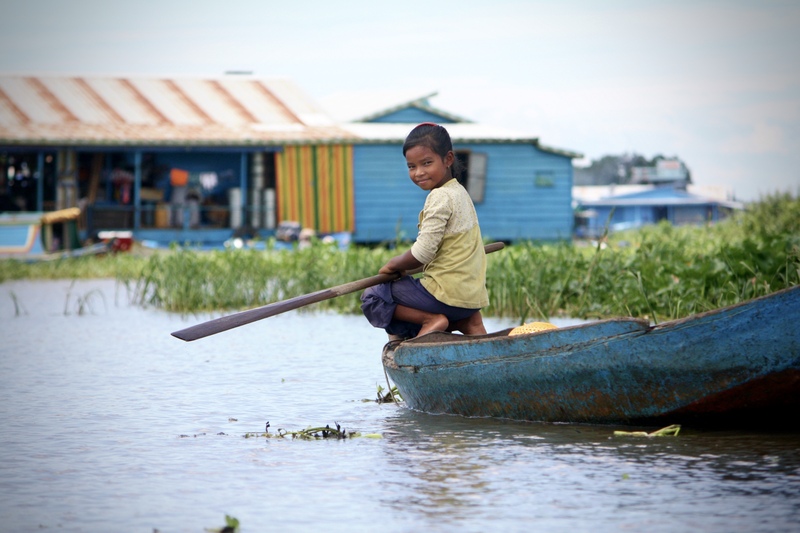 As the largest freshwater lake in Asia, it is also home to the floating communities of Cambodia. These floating communities clean, bathe and defecate in the lake that they live on. Most of them are fishermen and depend on the contaminated water for their livelihood. 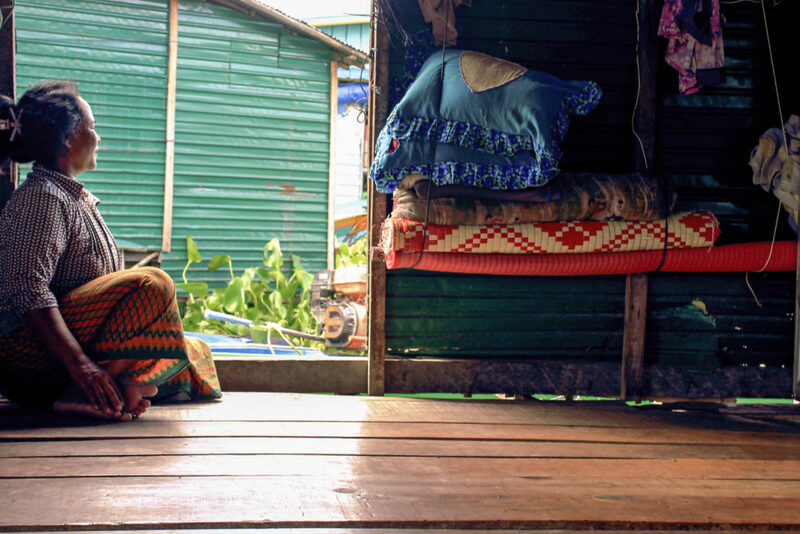 Left: A typical houseboat; right: a lady selling drinks and snacks in the floating village. Tab Savoeuon, 39, lived with her husband and their 7-month-old on in the floating village. Tired from a long day of work, Tab stopped to take a rest on the hammock as her son played inside the dark and narrow houseboat. Her husband was out on a fishing boat. When Tab opened her eyes again, her son was missing. Frantic, she and the other villagers searched for him in the murky water. Finally, at 5am, they found him. His tiny body was motionless, face down on a bed of water hyacinth. Nobody knows for sure how the baby had ended up there. We could only guess that when his mother closed her eyes for just a minute, the baby must have crawled to the edge of the boat. Maybe he was looking at fish and fell into the water. Maybe he too, fell asleep and rolled off the edge of the boat. But it does not matter because he was gone. Tab’s husband earned a meagre income from fishing, and the family did not even have money for a burial or a proper funeral. They placed their son’s body in an empty barrel, which drifted down the lake with the current. Villagers gathered to send the boy on his last journey down the water. 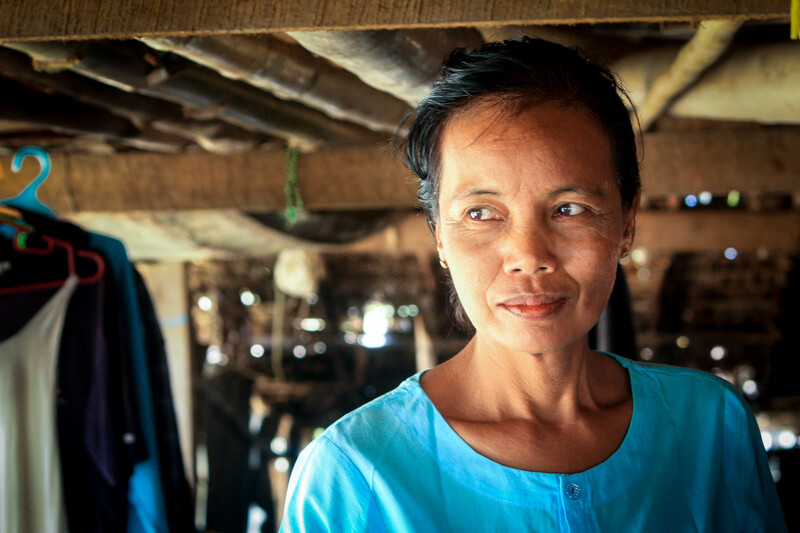 Tab and her husband, Sou Sok, were devastated after the death of their first son but life moves on. Years later, they went on to have five more children. Life only got more difficult. Sou was out on a fishing boat all day and Tab had to cook, wash, clean and take care of her young children alone in the day. She could barely rest for fear that another one of her young children would fall into the water and drown. With no affordable clean water source, the family of seven used the contaminated surface water for cooking and drinking. The children fell ill often with diarrhoea and fever. 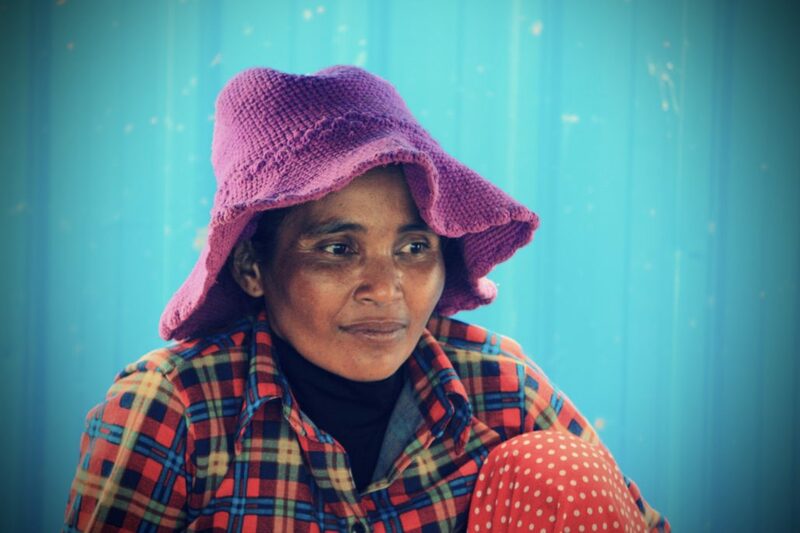 When her children fell sick, Tab could only sleep 1-2 hours a night. She stayed up to put ice on her children’s swollen stomachs to ease their pain. 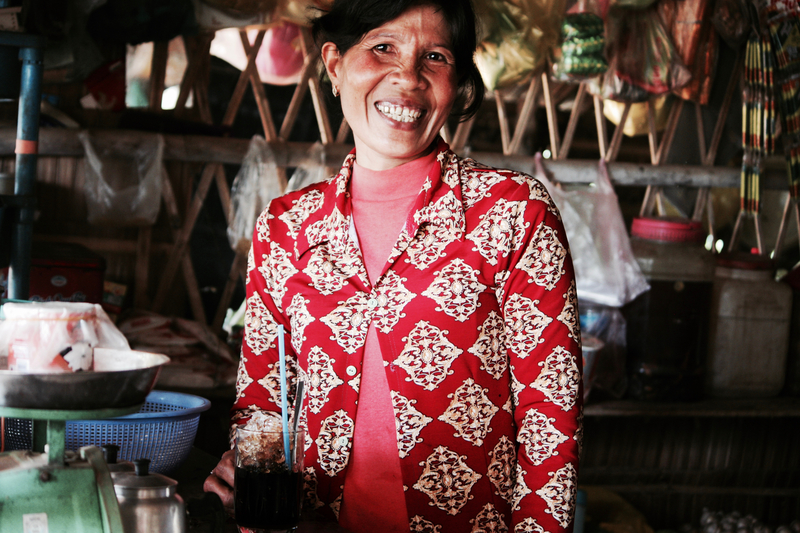 Things finally took a turn for the better when Sou Sok, Tab’s husband, became a water entrepreneur. 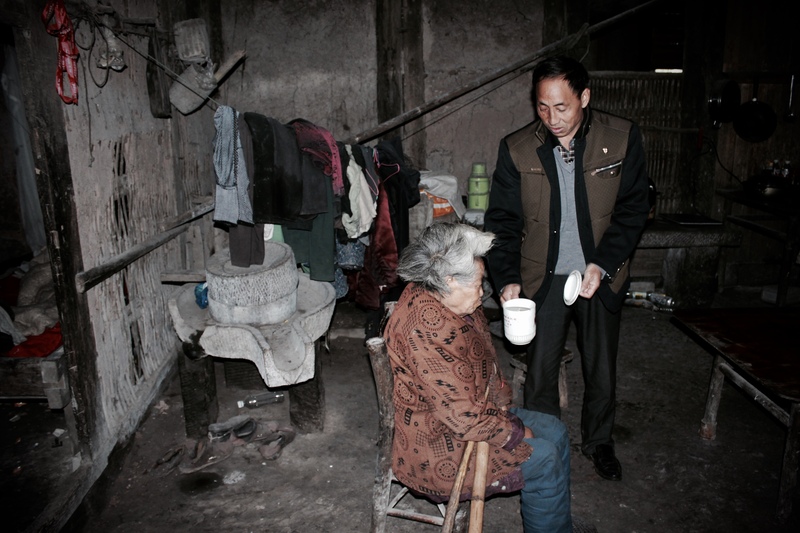 He was determined to make life better for his family and fellow villagers. 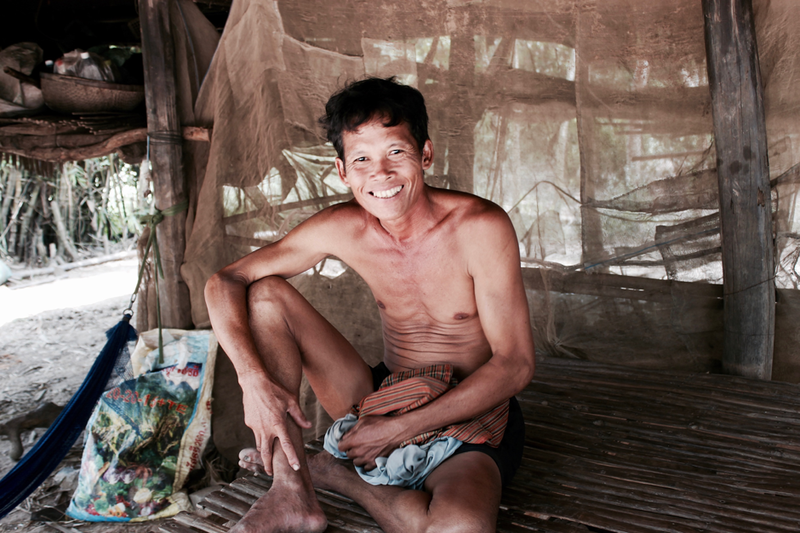 Sou Sok now earns enough income from being a water entrepreneur, and does not have to go out on the fishing boat anymore. The family moved their houseboat right next to the water treatment plant. Sou Sok can now help to look after his children, so the tragedy that happened 20 years ago will not repeat. 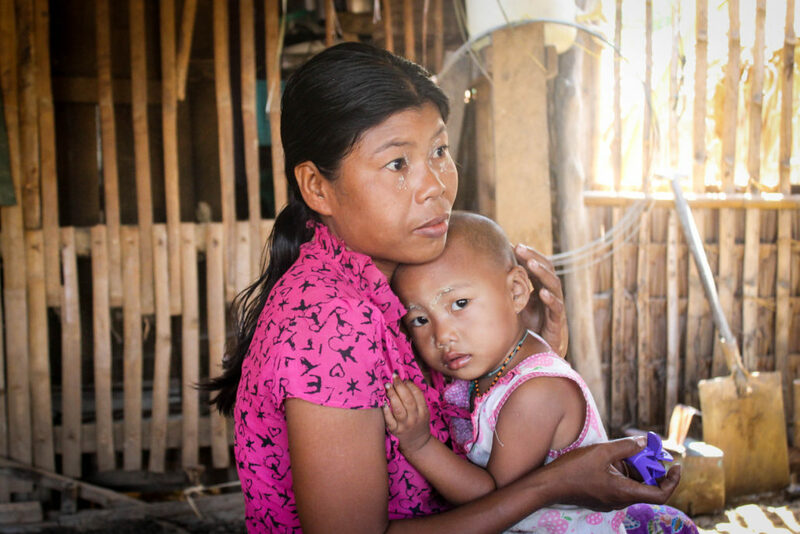 After gaining access to clean water, Sou and Tab’s children have not had serious diarrhoea for the past year. With better health, they do not miss school as frequently as before. 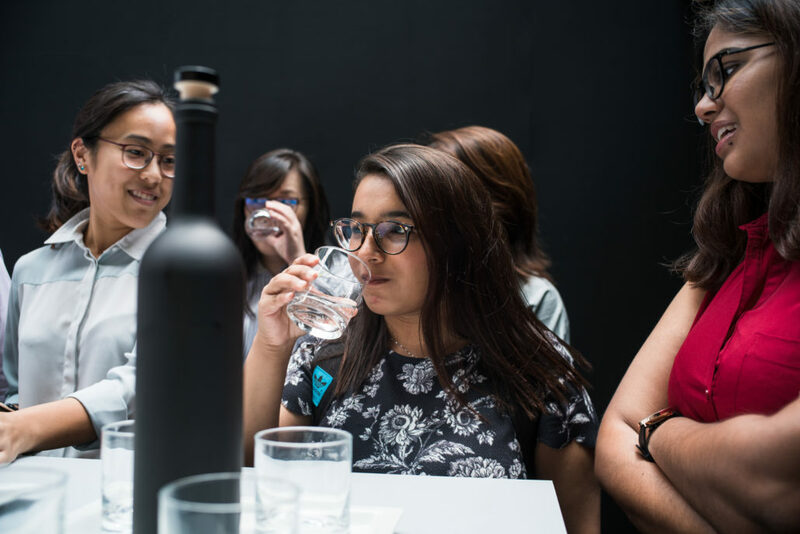 The tragic loss of their first child remains a thorn in their heart, but Sou and Tab are glad that they have more time to look after their children after he became a water entrepreneur. Since discussion began at the United Nations (UN) on the post-2015 Development Agenda, Singapore has championed a standalone UN Sustainable Development Goal (SDG) on water, sanitation and hygiene, as sustainable water supply is critical to development. 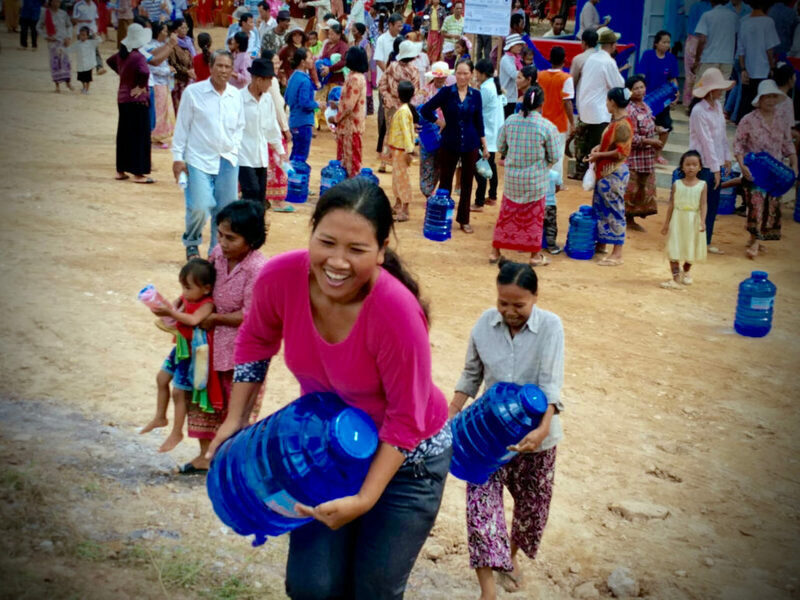 The handover ceremony at Kdul Village marks the commencement of the Ta An and Msar Krang Community Water Enterprises (CWE) in Cambodia. The CWEs have been established by Lien AID with the support of the Ministry of Foreign Affairs (MFA) of Singapore. These enterprises utilise a market based approach to provide affordable treated drinking water on a sustainable basis. 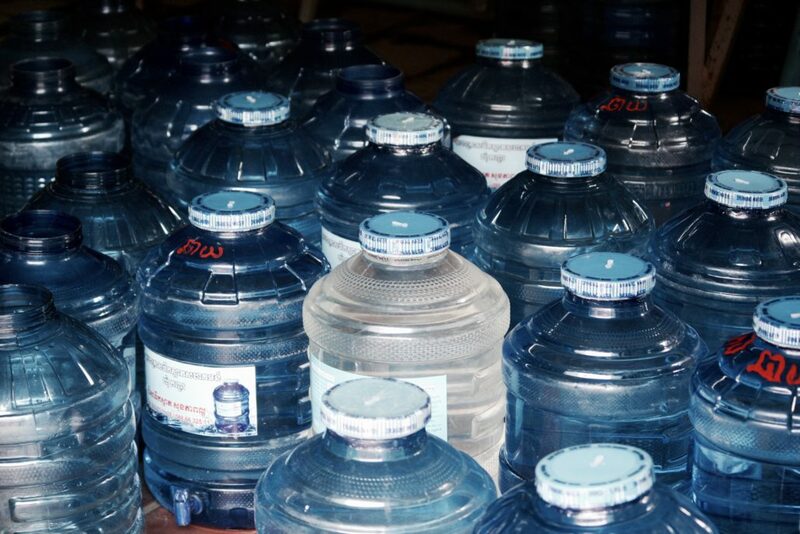 The communes will own, operate and manage the water treatment and bottling plant through a water entrepreneur and a Water Management Committee (WMC) selected from the local communities. Since 2011, Cambodia has seen more than 370,000 rural poor Cambodians benefit from the creation of 65 CWEs across 11 provinces. 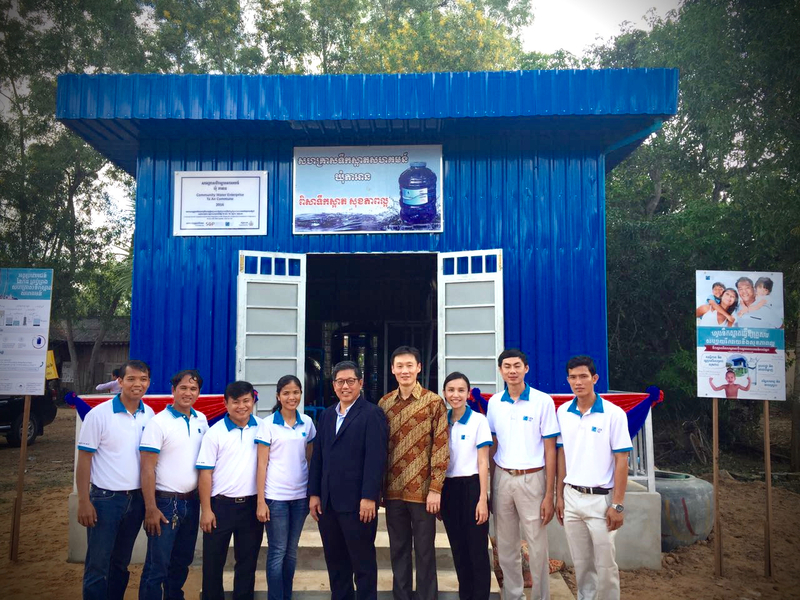 Singapore Ambassador to the Kingdom of Cambodia, Mr. Michael Tan, with Lien AID Chairman Mr. Michael Sim and Lien AID staff in front of the water treatment plant. 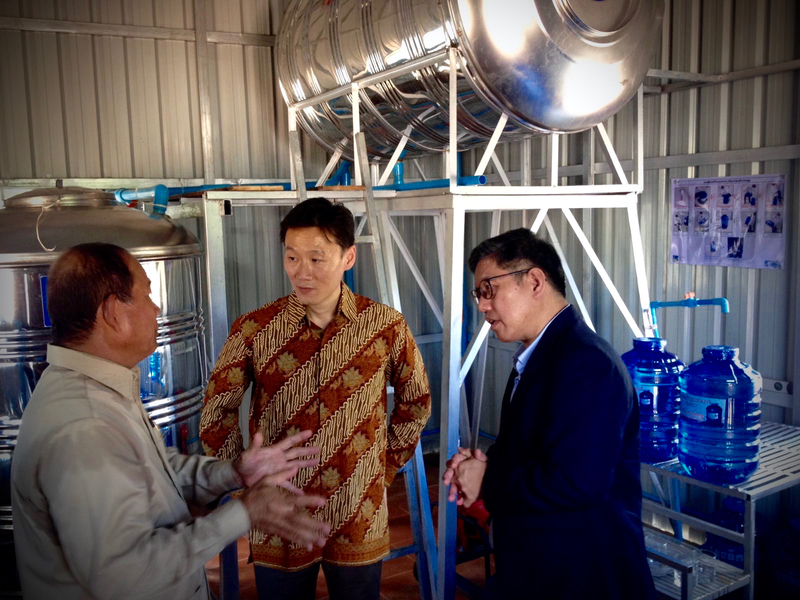 Singapore Ambassador to the Kingdom of Cambodia, Mr. Michael Tan speaks with Lien AID Chairman, Mr. Michael Sim and Cambodia Minister of Rural Development, His Excellency Dr. Ouk Rabun inside the CWE water treatment plant. This project is implemented under the Singapore’s Sustainable Development Programme, to support the UN 2030 Agenda for Sustainable Development, in particular our continued commitment to SDG 6 on clean water and sanitation for all. 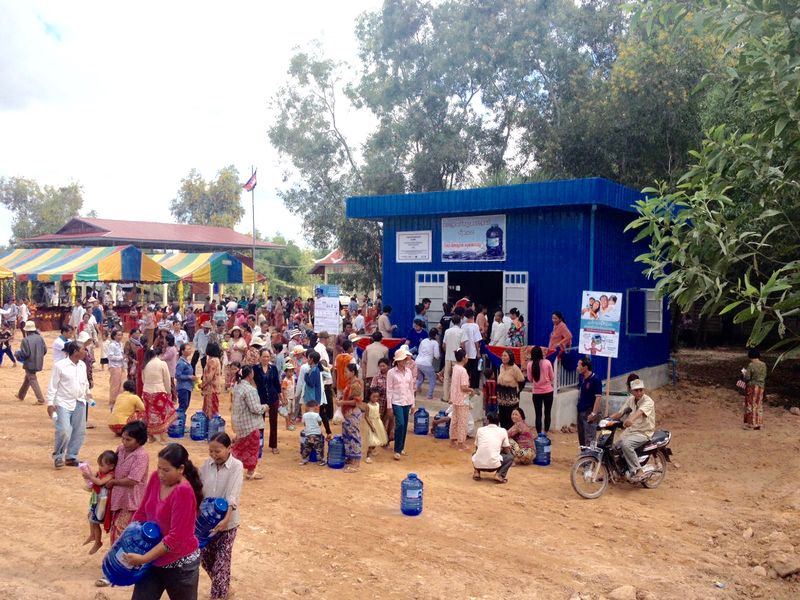 Villagers buying clean bottled water at the CWE handover ceremony. 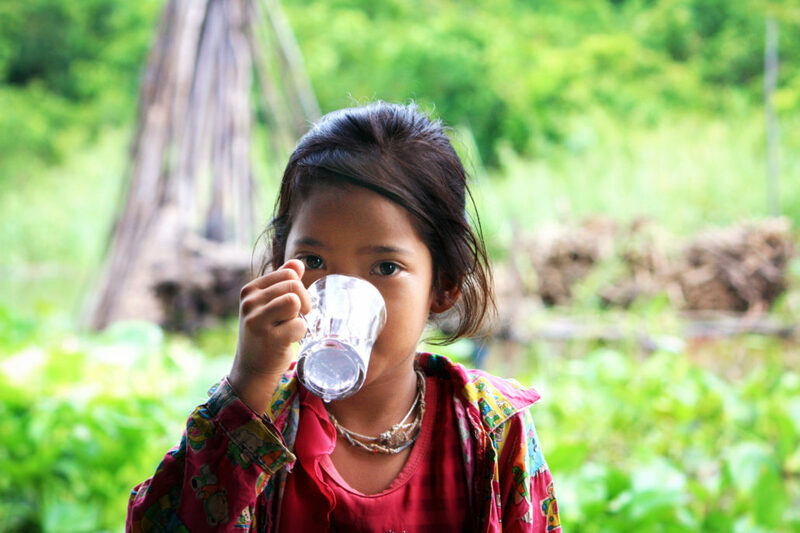 Clean water is essential to health and to the overall development of a community and country. Yet, more than 200 million in rural Asia still have no access to clean water. Established in 2006, Lien AID remains committed to exploring sustainable solutions and collaborative efforts with actors from governments, civil society organisations and the private sector, to enable clean water and sanitation access for rural poor Asians. When villagers in Puban are asked about Zhangli, they invariably refer to her as the “Prettiest Student Villager Officer (最美丽的村官)”. Zhangli was a fresh graduate and young mother of a little girl when she decided to apply to work in a rural village as a Student Village Officer (大学生村官). 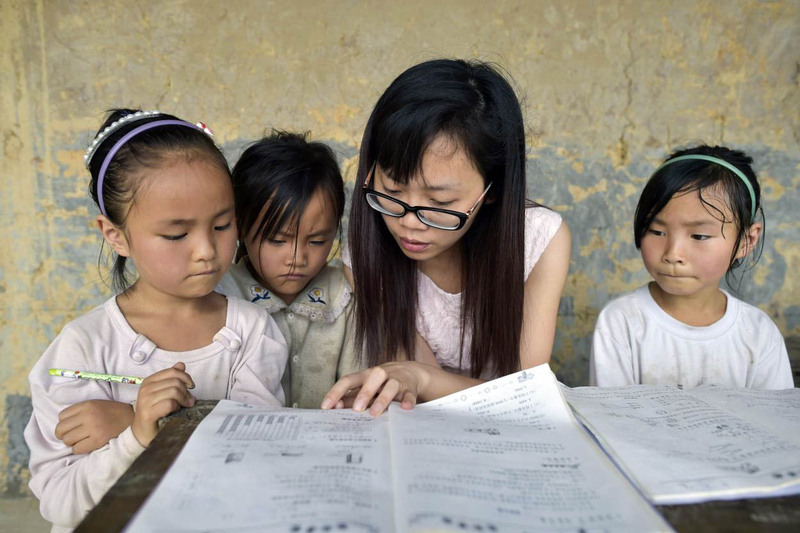 Driven by her passion for helping others, she applied to and passed the Chongqing Municipal Committee’s selection exams with flying colours, and was subsequently assigned to Puban village in Gangkou town, Wulong county. 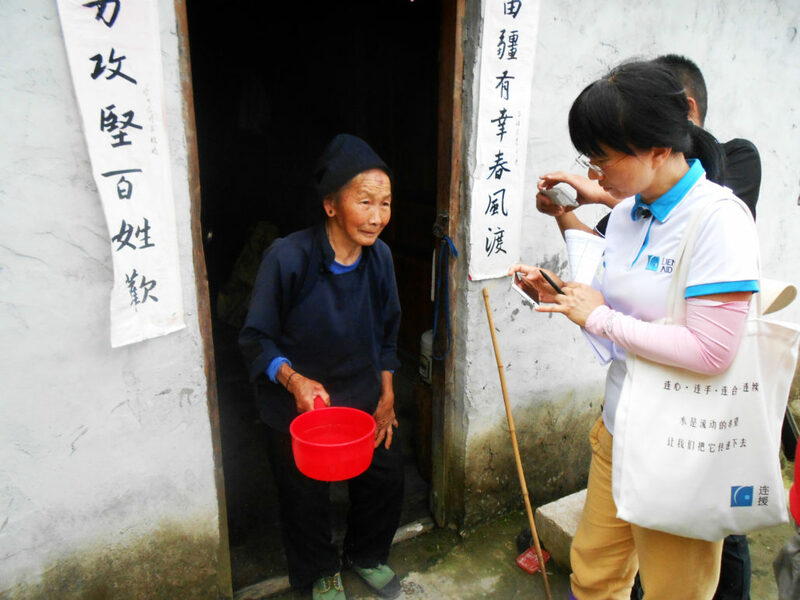 As a Student Village Officer, she would take up residence at Puban village, supporting and implementing the Chinese government’s poverty alleviation policies at the grassroots level, and work to improve the well-being of the villagers. Shortly after she arrived at Puban village in 2010, she was approached by a villager who was in dire straits from the death of more than 200 mountain goats that his entire household had depended upon for their livelihood. Together with some of the village leaders, they investigated the case and found that the goats had died due to the spread of disease in the dirty pens, which could not be cleaned regularly due to the lack of clean water. Subsequent visits, interviews and chats with other households in the village also unearthed similar issues. The root cause of their struggles with improving their means of livelihood was invariably linked to the lack of clean water. Thus when Zhangli found out about Lien AID’s Village Water Management programme, she submitted a project proposal for Puban village. However, as a certain amount of co-funding from local governments and villagers was required, Zhangli initially faced a shortfall of funds for the project. She refused to give up however, as she knew that a piped water system would enable the villagers to have a better quality of life. Whenever Zhangli talked to the “left-behind” children in the village, she would be reminded of her daughter, whom she had left behind to take up the post at Puban village. She was determined to make the project a success so that they would have a better life with clean tap water. 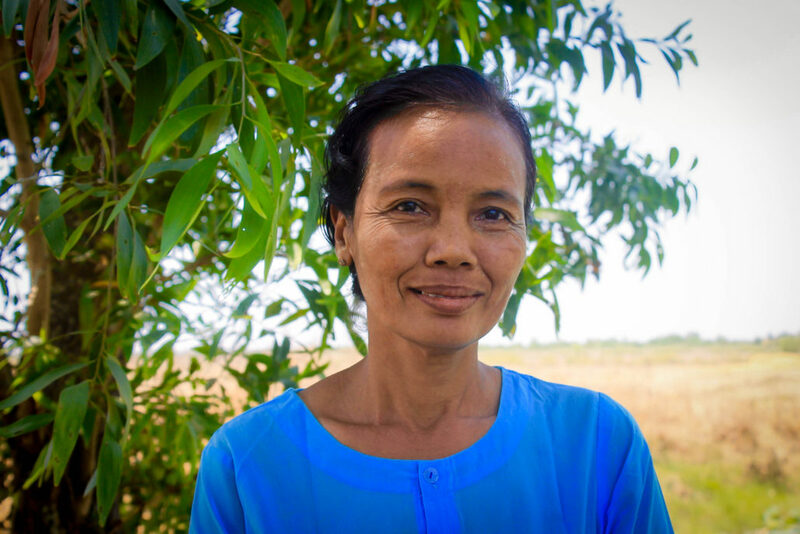 With the support of Lien AID, the local governments, and the villagers, she worked tirelessly to raise the necessary funds and made sure the project stayed on tract, and was able to successfully coordinate and supervise the construction of the rural piped water system in Puban village. Although she often had no time during the weekends to visit her daughter and husband, who were living in another town, she found satisfaction in the fact that the villagers and the children no longer had to fetch water or depend on unreliable water sources. In 2013, after the completion of the project, she was feted as one of the inspiring figures of Wulong county in the television programme “Ten Figures Inspiring Wulong” (感动武隆十大人物). 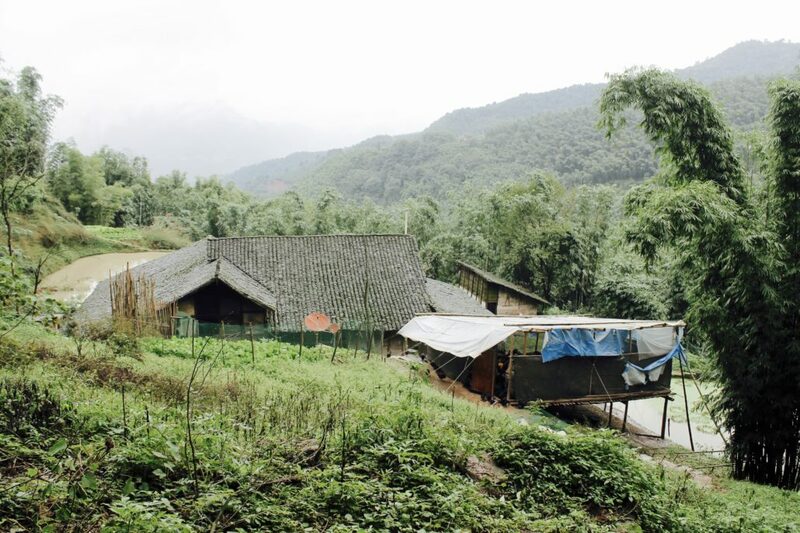 Even though she is no longer working as a Student Village Officer at Puban village, she continues to serve the rural communities through her capacity as the chairwoman of the Women’s Federation of Gangkou town in Wulong county. And the villagers still remember her as the “Prettiest Student Villager Officer (最美丽的村官)”. You can learn more about our work in China here.